The first step to becoming a skipper is to start sailing! You must become very familiar with the boat and how to sail her. If you're new to coastal sailing, there is much to learn and the best place to learn is out on the water. Sign up for trips and let your captains know that you're interested in becoming a skipper. They may assign you various responsibilities on the trip. The next step is to start helping maintain the boat. Get familiar with the systems on board and do your part to help keep her in good shape. Although the list of maintenance tasks may appear daunting, there is most certainly some way in which you can contribute. If you already have experience sailing boats the size of X Dimension, then the process of becoming a skipper will likely be much quicker. understanding of mainsail and genoa trim, including proper use of sheets, traveler, vang, etc. 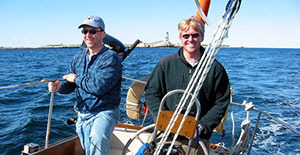 comprehensive knowledge of U.S. and international Navigation Rules.